Science Club is going strong at St. Charles!! We live in an exciting time for scientists. Much scientific information has already been collected and new facts are being discovered daily. Yet each new discovery makes it evident that there is a storehouse of scientific knowledge waiting to be discovered. 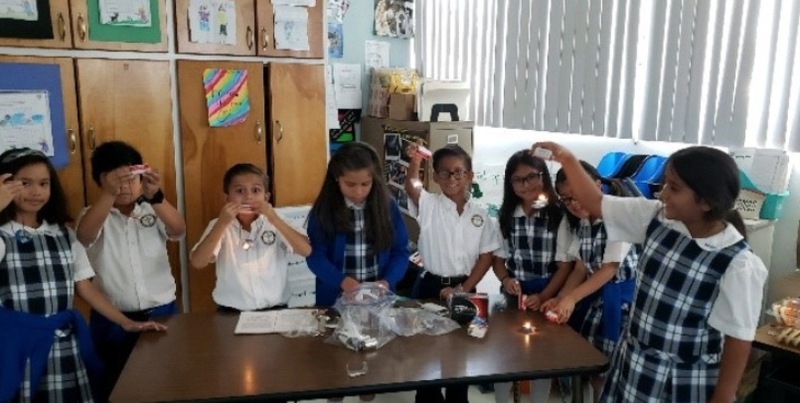 The after-school science club is grouped by grade levels and is a student interest-based science program that explores different concepts in science. The science club that is going on right now is an energy unit that focuses on electrical energy. We focus mainly on simple circuits that use a direct current. We also work with motors, fans, and lights for a hands-on experience on how we use electricity in our daily lives. For our culminating project, we explore alternative energy sources that utilize electrochemical reactions such as seen in the generating of electricity from a lemon. The next science club session will encompass our Solar System, which is very fitting since NASA is launching its ICON NASA Satellite. Many students and their parents have already expressed interest in the next science club. We are looking forward to our next session.